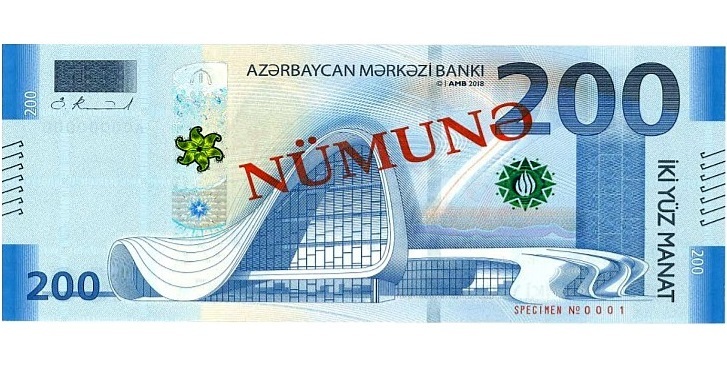 The Central Bank of the Republic of Azerbaijan has unveiled (24th May) a new 200-manat banknote denomination, which, when issued, will be the country’s largest value of currency in circulation. The banknotes are part of the current family of banknotes initially introduced in 2006 during which a currency re-valuation was also introduced that saw one new manat equalling 5,000 old manats. During the presentation, Elman Rustamov, governor of the Central Bank of Azerbaijan, commented to the assembled guests that the national currency is one of the key attributes of state independence and that the Central Bank decided to issue the new 200-manat denomination note (U.S. $117.60) into circulation in light of the dynamic growth of the country’s economy over the recent decade. Mr. Rustamov further added that changes in the structure of cash in circulation, as well as cash handling, had developed recently into a highly efficient process. The project of designing the note was secured by the Crane Currency Company, which is based in the United States, with the actual production of the currency notes incorporating some of the most advanced security features being awarded to Giesecke & Devrient. 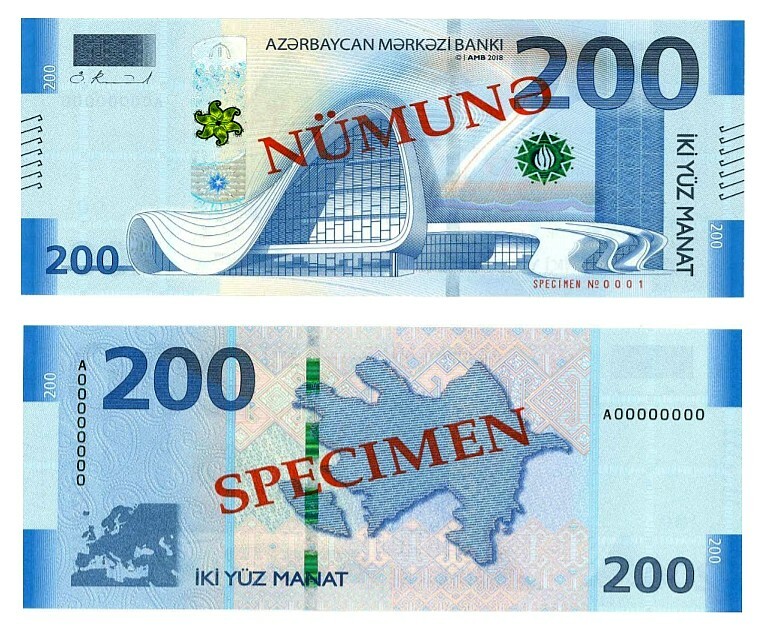 Mr. Rustamov noted that the face of the 200-manat note depicts the Heydar Aliyev Center, which was constructed in memory of the architect of the independent state of Azerbaijan, Heydar Aliyev (1923–2003), who became the third president of the country, serving from 1993 until 2003. The face of the new 2018-dated banknote, which displays a pale blue dominant colour scheme with corresponding under-print, features the impressive image of the Heydar Aliyev Centre, one of the most contemporary architectural symbols of the country’s capital city of Baku. The note measures 160 by 70 millimetres and additional designs include elements of the main exterior and interior of the Aliyev Centre, elements of national rug patterns, and other national ornaments. The back includes a depiction of the country in the form of an outline of the geopolitical state, which is situated in the Caucasus. It is expected that the banknote will be released into circulation in June, though no specific date has been officially announced. The current manat banknote series includes six other denominations ranging in values from one to one hundred manats. For additional information on this note and previous banknotes and coins issued by the Central Bank of Azerbaijan, please visit their website.